In terms of the mental health contract, Common Ground’s sole function had been to serve as a gatekeeper. Did the client need psychiatric hospitalization — yes or no? To improve outcomes for patients and reduce costs, Common Ground began offering the breadth of its programs to mental health clients as needed. As a result, psychiatric hospitalization rates for the 6,100 people it assists annually under the county contract have dropped to an average of 19 percent year to date from 45 percent in 2011. That’s saved Oakland County millions of dollars, President and CEO Tony Rothschild said, while helping improve outcomes for clients. Common Ground, which is operating on a $13 million budget for fiscal 2015, also restarted a mobile crisis team that had been dormant for five or six years because of funding cuts by shifting some of its funding from the county. The team responds to mental health crisis situations in the community, helping to de-escalate the situation and link that person and/or his or her family to needed services. The team also follows up with patients to ensure they are keeping to their mental health treatment plan and assistant area hospitals with follow up for mental health patients — again, helping clients manage their care and lowering hospitalization rates. Common Ground currently serves 70,000 people each year, up from half that number in 2008. At the same time, in a bid to get ahead of the health care changes bringing behavioral and physical health together, Common Ground forged a collaboration with three other nonprofits. Partners 4 Health plans to use home visits and a triage approach to help reduce the issues that lead some patients to the ER for treatment time and again. With funding from at least three early grantors in hand, it’s preparing to launch a pilot with an undisclosed area hospital aimed at decreasing the high number of hospital visits for patients suffering from chronic physical illnesses. After being named a finalist in 2010 and receiving an honorable mention in 2004, Common Ground is Crain’s 2014 Best Managed Nonprofit. Gary Dembs, a judge in the contest, is past chairman of Common Ground’s board and recused himself from deliberations about the nonprofit. For a person in crisis, offering a range of services and referrals when needed from a single location is a huge step forward in improving client service, Rothschild said, since it prevents them from having to look up seven or eight telephone numbers for different types of assistance. There’s no other local crisis service that has the number of services Common Ground offers under one roof, Rothschild said. After adopting a recovery coach model that brought in peers who’d suffered from mental illness and were managing it, Common Ground began to look for other ways it could better assist mental health clients. Its leadership traveled to Arizona to benchmark best practices at Recovery Innovations in Phoenix. The agency wrote new protocols on things such as internal referrals between programs and changed some job descriptions. Nurses shifted to doing medical assessments rather than psychiatric screenings to better serve the client and cut down on the number of people sent to the ER. When someone comes in now, part of resolving the crisis is bringing in the expertise from Common Ground’s other programs. A patient with schizophrenia, for example, who is also in a domestic violence situation that makes it difficult to comply with a mental health treatment plan would be referred to the agency’s victims of crime program for counseling and advocacy assistance. Or, a 19-year-old who is homeless and bipolar might be connected to Common Ground’s transitional housing. With a stable living situation, a person is more likely to adhere to a plan to manage the mental illness. Early this year, Common Ground moved into a former nursing home in the county government complex, consolidating its programs that had been housed on different floors of Doctors’ Hospital of Michigan in Pontiac and its crisis residential program from Royal Oak. The arrangement was beneficial to Common Ground, since it provided a nonclinical, renovated space large enough to consolidate most of its programs. And in return, the county is saving millions of dollars in hospitalization costs, Rothschild said. Borrowed from Recovery Innovations, the design for the new site incorporates open spaces, new lighting and lots of couches to put people at ease. It’s been an important factor in getting more patients to look into the short-term residential placements Common Ground offers on its second floor as an alternative to hospitalization. The center provides short-term voluntary psychiatric and substance abuse care. Its design “says we respect you as a person; we’re going to give you a first-class facility,” Rothschild said. 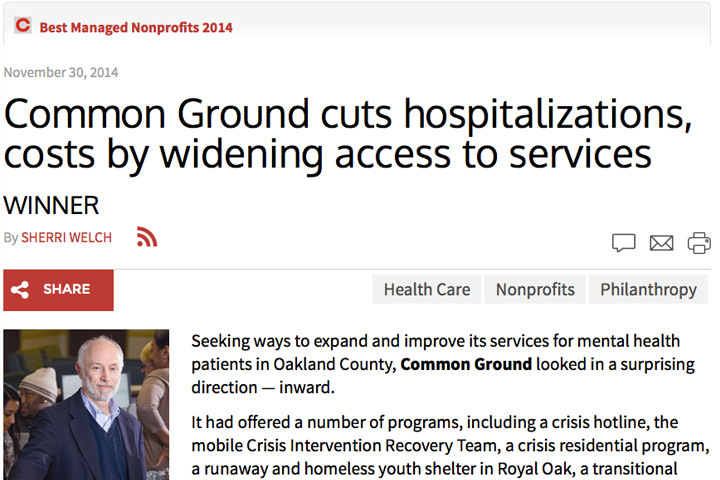 Common Ground is now working to take its success in reducing psychiatric hospitalization rates in Oakland County on the road. Four years ago, Common Ground began offering mobile crisis response services under a contract with Genesee County Community Mental Health. More recently, it began consulting with Macomb County — which along with Wayne County has seen psychiatric hospitalization rates as high as 70 percent — to set up a mobile crisis team and move mental health assessments out of the hospitals and into a separate crisis center. 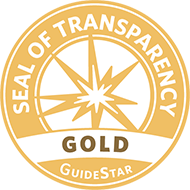 Rothschild said he and Common Ground are intent on adopting best management practices as well as best practices in its programs. After seeing permanent endowments hailed as a best practice to help nonprofits be sustainable, Common Ground began raising money for one. Housed at the Community Foundation for Southeast Michigan, the fund stands at $700,000-$750,000 today. The nonprofit also is studying what it would do if its current Oakland County contract was downsized or other sources of funding are cut. Planning efforts began four years ago, with a $50,000 investment from Common Ground and each of the other founders: Southwest Solutions, Neighborhood Service Organization and Oakland Family Services. And Partners 4 Health officially launched late this summer. The new nonprofit plans to use a triage approach to help work toward preventive care for chronic health issues that lead to high emergency room and hospital visits. That could be connecting those patients with a primary care physician or assessing their homes for issues such as mold and themselves for depression and anxiety, substance abuse and social isolation leading to repeat visits to the ER. “The business plan calls for contracting with insurance companies, especially Medicaid insurance companies, because we’ll cut their costs by reducing hospitalizations and overuse of emergency departments and doctors,” Rothschild said. The joint nonprofit has secured initial grants from three funders, including insurer Blue Cross Blue Shield of Michigan and plans soon to begin a $500,000, six- to eight-month pilot with an undisclosed area hospital. “We’re not afraid to take risks,” Rothschild said. “Sometimes you have to spend some money to develop an idea and not just wait for funding. “If it’s a good idea, money will come,” he said.